Alright, here is chapter 20! Again, sorry for 19. But it’s Christmas now! Christmas… wait, Christmas… OMG CHRISTMAS!!! AHHHHH!!!! (fangirling about my own writing). Okay, and for those of you who are wondering (stares at KatherineElizaEponineHamilton) Lexi IS a girl, okay? Okay. Okayokayokayokayokay. Keep that in mind. Here are chapters 1 2 3 4 5 6 7 8 9 10 11 12 13 14 15 16 17 BONUS 18 19 , and enjoy this Christmas chapter. Oh, and also, I didn;t edit, and this is the chapter where I had MAJOR writer’s block, the first time EVER for THIS story. I was so disappointed, and I had it for, like, three or four days. And Christmas is supposed to be easy! Anyway, enough about my life. Here we are! Christmas Eve rolls around, and Alex is woken up by someone jumping on his bed. “Wake up wake up wake up WAKE UP!” John shouts. “It’s Christmas Eve!” Alex groans and rolls over. “Come on Alex!” He jumps on the bed again. “Fine, I’m up, I’m up,” Alexander says groggily. “And put on some of your Christmas clothes!” John tells him before rushing out of the room. Alex gets up and puts on some skinny jeans and a Christmas sweater. He then slips on some fuzzy socks and heads downstairs. Laff, Herc, and their families are already here, even though it’s only seven in the morning. Alex looks at the clock and sees that it is not in fact seven, but actually ten o’clock. John must have let him sleep a little longer than what they agreed on. Oh well, he’s not complaining. “Merry Christmas Eve mon ami!” Lafayette says. He and Herc are currently giving James and Henry piggy-back rides, and they have matching sweaters on. “Merry Christmas Eve!” Alex responds. Of the four of them, John is definitely has the most Christmas stuff on. He’s wearing a Santa Claus hat, a Christmas sweater, fuzzy socks with presents on them, comfy-looking leggings with ‘Merry Christmas’ written on them a thousand times, and battery powered lights strung all around himself. And surprisingly, he can pull it off! But I mean, it’s John, he looks adorable in anything. The Hamilsquad goes upstairs to hang out in John’s room. Alex and John are really excited for tomorrow, because they want to put their plan into action. Little do they know, however, that Laff and Herc have a plan of their own. But little do Laff and Herc know, their plan is going to backfire. So Christmas should be fun! The Christmas Eve dinner is way better than Thanksgiving’s, partly because Christmas music is playing in the background, and the food is more festive. After they’re done eating, they all gather around the tree to open their Christmas Eve gifts (which are always pajamas). James and Henry go first, and they both get cute pajamas with their names on them. Since he’s technically the youngest, Alex goes next. He gets green and white striped pants with a long sleeve black shirt that says, ‘I Still Love Christmas’. John is next, and he gets pajamas that have little turtles all over them, but the turtles are wearing tiny Christmas hats. He once again squeals, but it’s not as high pitched as before. “Thank you thank you thank you thank you!” he says rapidly. Next is Herc, and he gets pajamas with reindeers on them. Last is Laff, who gets pajamas that look really similar to Herc’s, which was probably done on purpose. Of course, John’s parents don’t get it, but everyone else does. So this how Christmas will go for them: They spend the morning with their family, and then at noon they will all go Laff’s house to celebrate together. This is when John and Alex will put their plan into action. Everyone goes to bed early, especially James and Henry,who want to wake up to presents, and possibly see Santa Claus (they’re young, what are you gonna do?). John rolls over, and it takes him a second to register what he said. Then his eyes widen and a smile spreads across his face. “It’s Christmas!” he shouts, getting out of bed. As if they are five, they rush downstairs to find James and Henry already awake, along with their very tired looking parents. “They’re here, they’re here! Can we do presents and stockings now?” James asks. “Of course,” their mother replies. They all delve into their stockings, unburying candy, small toys, and either gift cards or money. They then move on to presents. They let James and Henry go first. With smiles on their faces, John and Alex watch as they unwrap trucks and cars and a bunch of other fun stuff that they picked out for them. “Mom, dad, you two should go next!” John offers, pushing a pile of presents their way. “That’s so sweet of you,” his mom says. They both open up their presents, and they love them. Next is Alex and John. The very first thing that Alex reaches for it the perfect rectangle with silver wrapping and a blue bow. “Fine,” he says, reaching for a cube with little Santa Clauses all over it. “To John, From Santa.” He opens it up to find something that he has secretly been wanting, but never told anyone about. At least, he doesn’t think he did. It’s a birthday cake scented candle with real rainbow sprinkles in it. He gasps and smells it. “It smells just like birthday cake! Thank you Santa,” he says, careful not to look at his parents in case that gives something away. Alex is next. 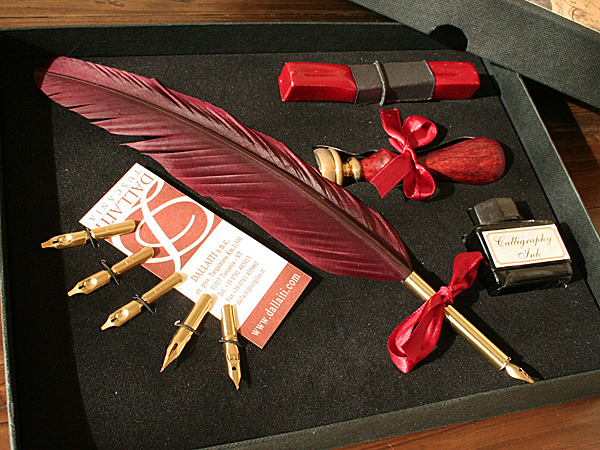 He also grabs a present from ‘Santa’, and he unwraps it to find a quill set, complete with a red quill, various tips, ink, wax, and a wax stamp. “I’ve always wanted one of these!” he exclaims. The thing is, they know Santa is not real, but sometimes, for a moment it seems like he is, because they’ve never told anyone that they want this, but John’s parents manage to get it for them. They go through the rest of their presents, and they finally get to the presents they were told to set aside. “John, you go first,” Alex insists. “No no, you first,” he replies. “How about you open them together?” John’s dad asks, his phone out to take a video. They both open up their presents. John gasps as he pulls out a tablet along with a twenty dollar iTunes gift card. “OH MY GOSH!! !” he shouts. “I HAVE A TABLET!” His eyes are wide, and there is a smile on his face. Alex gets the double wrapping off of the package and yells, “NO WAY!” He pulls out a hybrid computer, which means it is both a laptop and a touchscreen tablet. It’s complete with a mouse and a stylist. “A HYBRID!?! ?” he shouts. “I just know you so well,” John replies. “Omg I CAN! Alex, you are the greatest person in the world! No offense mom and dad,” he adds with a laugh. “I’m glad you’re both happy,” Mrs. Laurens says. They clean up all of the wrapping paper, and bring their gifts upstairs. They still have about two to three hours before they have to go to Laff’s house, so they begin to explore their new devices. “Is it weird that I already know the best app for drawing animations?” John asks as he’s entering the code on his iTunes gift card into the tablet. “Not at all,” Alex replies, getting his hybrid set up. He already has a laptop, but this will be a lot easier to work with for things other than typing. It can be his personal computer, while the other one can be for school and stuff. “But I might use that idea,” he says thoughtfully. “About what?” John asks, curious. “But what’s the main idea?” John asks, curious. “I’ll let you read it once I have a few pages,” Alex promises. “Alright,” John groans, a little bit disappointed. A couple hours later, they bundle up and head over to Lafayette’s house. Herc is already there, and he’s placing his presents under the tree. “Merry Christmas!” Laff greets as he lets his friends in. “Merry Christmas!” John and Alex reply. They head into the living room and put their presents for their friends under the tree. Alex and John are a little bit shocked. Do they know their plan? “Sure,” Alex says, getting up. John follows suit. You see, Laff and Herc had set something up where a plate of whipped cream would smash into their face when they open the fridge. Thinking it didn’t work, they both bolt for the fridge. Lafayette flings it open and gets a face full of whipped cream. The three of them start laughing. “I assume that was meant for us?” John asks between fits of laughter. Laff nods and moves to get paper towels, but Alex stops him. “Look up,” he says. Lafayette and Hercules both look up and see the mistletoe hanging over their heads. Herc’s jaw drops, and Laff begins to blush, even though it’s hard to see because of the whipped cream. “Here, wipe yourself off first,” John says to Laff, handing him some paper towels. He wipes off the whipped cream, and you can see how red he is. Herc is also blushing, and they both look up at the mistletoe again. “Well, what are you waiting for? Just kiss!” Alex encourages. He’s cut off by Laff gently putting his hands on his boyfriend’s face. Herc stops talking as Lafayette leans in. Their lips connect. Laff is the only one that has kissed someone before, and that was back in third grade, in France, when someone told his to kiss his crush. Even from that small little kiss, he can tell the difference. Her lips were soft and delicate, like an angel’s wings. Herc’s seem a bit more firm and coarse, yet gentle at the same time. And he likes it way, way better. The fact that his lips currently taste like chocolate helps, too. It’s a short, gentle kiss, but by the time they pull away, both of them are smiling. “ALRIGHT ALRIGHT, THAT’S WHAT I’M TALKING ABOUT!” John says loudly. He can’t hold it in any longer and he starts running around the house like a maniac, squealing the whole time. He’s such a five year old sometimes. He comes back, panting. Alex glances at him, a small smile tugging at his lips. John is still grinning, and he runs up to Laff and Herc, giving them a big hug. They know what he’s talking about, and Laff replies, “Your welcome mon ami.” John pulls away and rushes over to Alex. “Our plan worked!” he exclaims. “Hercules et moi venons d’avoir notre premier bisou!” Lafayette exclaims, wrapping his hand around his boyfriend’s. His mom puts her hand to her heart. “Mon petit garçon est grand,” she says affectionately. John watches them, small tears of joy in his eyes. He is so happy for them. “John, are you crying?” Alex asks quietly. “Mhmm…” Alex replies, raising his eyebrows. John shoves him playfully. “Let’s do this!” Laff shouts, dragging his boyfriend into the living room. Alex laughs, and he and John follow them. At the moment, only one person flashes into his mind. A cheerleader girl with dark brown hair that almost always wears red. But he can’t say that, because then they might know about… what happened. Herc turns to Laff with a look of I told you so on his face. “If you say so mon ami,” Laff remarks. Oh no, he knows about Maria! Alex thinks, worried. Herc moves behind him and pulls out his rubber band. 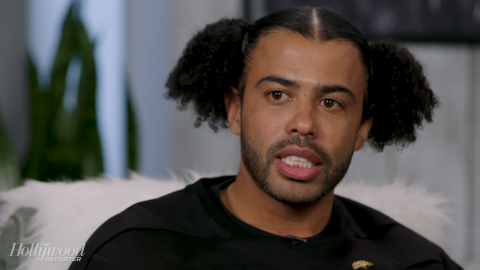 He fluffs out his hair before getting another rubber band and putting his hair into pigtails, which end up being two little puffs of hair on the side of his face. “Dare,” he says, already knowing he’s going to regret this. He would have said truth, but he knew Laff would make him tell Alex who Lexi was, and he was not about to do that. “Well then, just picture Lexi’s face!” Laff says. “Oh come on mon ami! What harm could it do?” Laff says. “Ugh, fine.” John takes a deep breath and removes the pillow. Platonically, he says, “Hey. Has anyone ever told you what beautiful eyes you have? The way they shine when you’re excited? How they look like smooth, melted chocolate? And that’s just part of what makes you cute. Not only is it your looks, but your personality, too.” John bites his lip and his face turns red. “You’re always so determined, and I love that about you. Gosh, I’m always at a loss for words around you. It’s a miracle I can even say what I’m saying right now.” He gives Alex a goofy grin, the same kind he would give to Lexi if he was saying this to her. “And, I don’t know if you know this, but you are the first and last thought that runs through my head every day. So why don’t you dump that boyfr-, wait, girlfriend, of yours, and date me instead.” John winks and feels his face turning bright red. Jeez, who knew how easy the words would come. Maybe he’ll be able talk to Lexi like this, too. John smiles and then buries his head in the pillow. “There, I did it. Satisfied?” he asks Laff. “Yes,” Lafayette replies, his voice cracking slightly. Since John’s face is in the pillow, he doesn’t see that Alex has turned a deep shade of red. He bites his lip and looks away, hoping Herc and Laff didn’t notice. “Truth,” he replies, deciding to go the safe route. “Good to know,” John murmurs, turning slightly pink. “Alright, Alex, truth or dare?” Hercules asks. John throws his hands up in the air. “If this is supposed to make me ask her out, it’s not gonna work!” he shouts. He takes a deep breath and turns red. “Why are they making us do this?” he mutters. “No idea,” John replies quietly with a pointed glare at Laff and Herc. He squeaks, “I’ll be right back.” He then runs upstairs, taking the pillow with him. John jerks up, sees Alexander, and swears quietly. “Wait, since when did you swear?” Alex hisses so that Momayette (aka Lafayette when he acts like a mom) doesn’t hear. “Heckity-heck-heck,” John replies, glaring at him. John bites his lip and looks away. “Uh… gotta go to the bathroom, bye!” He runs to the bathroom and slams the door behind him. What was that all about? He thinks quietly. He hears a soft knock on the door. “John? Are you alright?” Alex asks. John takes a deep, deep breath, and opens the door. “Yeah, I’m fine. Now let’s go continue our game.” He walks past Alex, not even waiting for a response. They walk downstairs, and Laff raises his eyebrows in a questioning way. “Care to explain?” he asks. “Explain what?” John replies innocently, but he doesn’t meet Lafayette’s eyes. So that is how John and Alex get stuck doing TONS of very stupid and embarrassing dares because they really don’t want to tell him what happened. And let’s just say, Laff and Herc are having a blast. “John, truth or dare?” Herc asks. “I give up! I give up! I say truth!” John says throwing his hands in the air. “Come on mon ami!” Laff encourages. John gives him the death glare, which is not something you see every day. “Please John!” Alex begs with puppy dog eyes. “Stay here with us,” Lafayette adds. John turns to go, but Alexander grabs his hand. “Come on John, we still have to go volunteer at the soup kitchen!” He gives John the puppy dog eyes. He doesn’t look convinced, so Alex rubs his thumb in circles on his hand, trying to sooth him. They all get up and start getting their coats on. They then call an Uber and go to the soup kitchen. “Well, everyone deserves a good Christmas,” John replies. She smiles at them and leads them inside, showing them where they are going to be working. She then leaves, and they get to work. After about half an hour, someone comes out from the kitchen to refill the soup. He and Alexander lock eyes, and he almost drops the soup. He sets it down on a nearby counter and just stares at Alex. “Alex?” he asks. James is an eighteen year old with shaggy brown hair and soft brown eyes. It’s been two years, but he could recognize that voice anywhere. Alexander runs up to his long lost brother, embracing him. “James!” he exclaims, tears threatening to flow. “Alexander! Thank goodness you’re safe! After the hurricane, I thought…” His voice trails off, and he chokes back sobs. “James, I can’t believe you’re here! This is the best Christmas ever!” Alex exclaims, a few tears trickling down his face. “It is. It truly, truly is. Oh, you’ve gotten so big! You look so much more mature!” He finally looks up and sees Laff, Herc, and John watching them. “Who are they?” he asks, nodding towards them. Why are so many people named James? Laff wonders. Is this an American thing? “Okay,” Alex replies, his voice cracking slightly. James smiles and gets back to work, and so does Alex. “Were you two close?” Laff asks, curious. And hour later, they finish up and Alex says goodbye to James before they head back home. The whole drive back, he has his phone out, texting his brother. When they get back to Laff’s house, they go into the backyard and build a snowman together. “Yeah?” Laff replies, turning around. He’s greeted with a snowball to the face. “Oh yoU’RE ON!” he shouts, making a snowball and chucking it at his boyfriend. Alex shoves snow into John’s hood and puts it over his head. “HEY!” he shouts, laughing. This starts a big snow fight between everyone, which leaves them all freezing cold and covered in snow. “Le-let’s get s-some hot co-cocoa,” John shivers. They all nod in agreement and head inside to get hot cocoa. Overall, it was a very, very good Christmas. EEEEEEEEEEEEEEEEEEEEKKKKKKKKKKKKKK!!!!! I JUST LOVE EVERYTHING ABOUT THIS CHAPTER!!! And shout out to my mom, kendraswc, who gave me the idea for Hamilton’s brother!